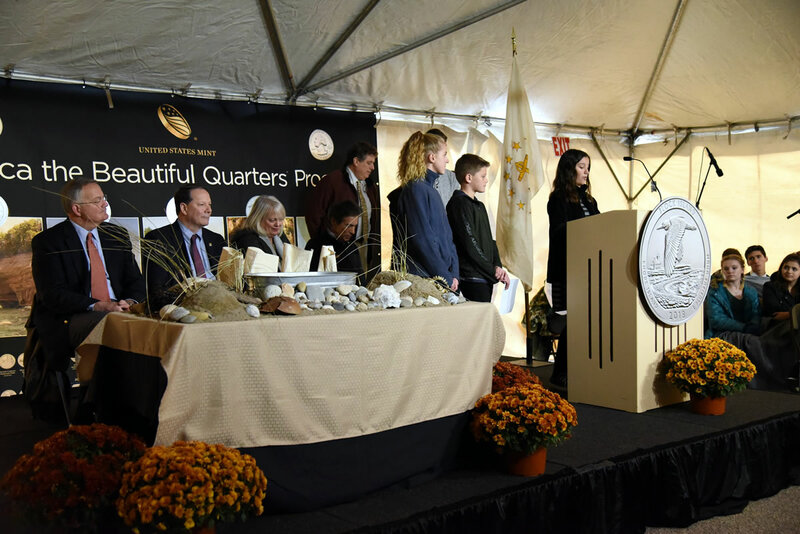 Last Thursday, Nov. 15, quarters celebrating Block Island National Wildlife Refuge in Rhode Island were officially introduced to the public. U.S. Fish and Wildlife Service Principal Deputy Director Margaret Everson, U.S. 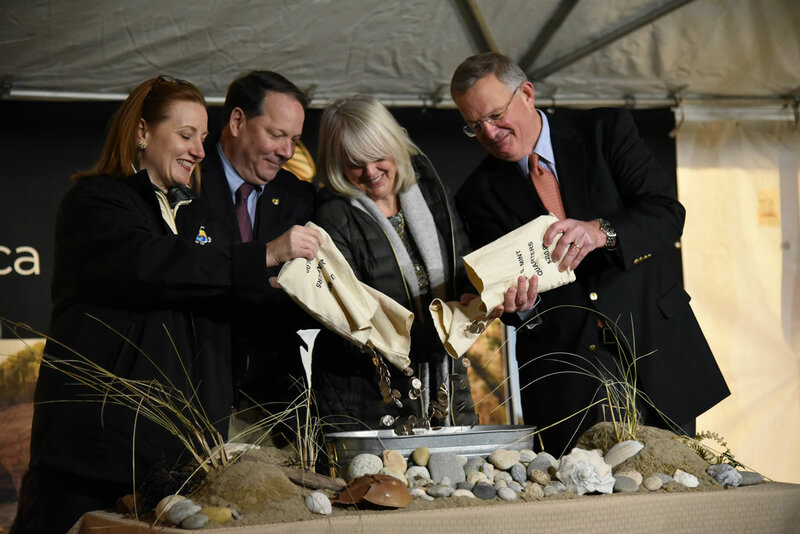 Fish and Wildlife Service Deputy Director James Kurth, Department of Environmental Management Director Janet Coit, and United States Mint Director David J. Ryder participate in the ceremonial coin pour during the launch of the Block Island National Wildlife Refuge quarter in Charlestown, R.I., Nov. 15, 2018. The coin is the 45th release in the United States Mint America the Beautiful Quarters® Program. U.S. Mint photo by Sharon McPike. A crowd of around 325 people, including about 100 schoolchildren, attended the outside tent event which was hosted by officials from the U.S. Mint and U.S. Fish and Wildlife Service. 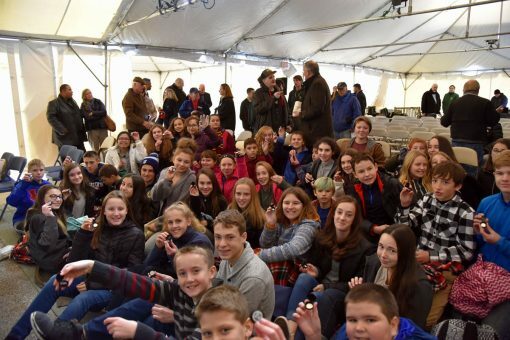 Kids aged 18 and under received a free Block Island quarter to commemorate the ceremony. 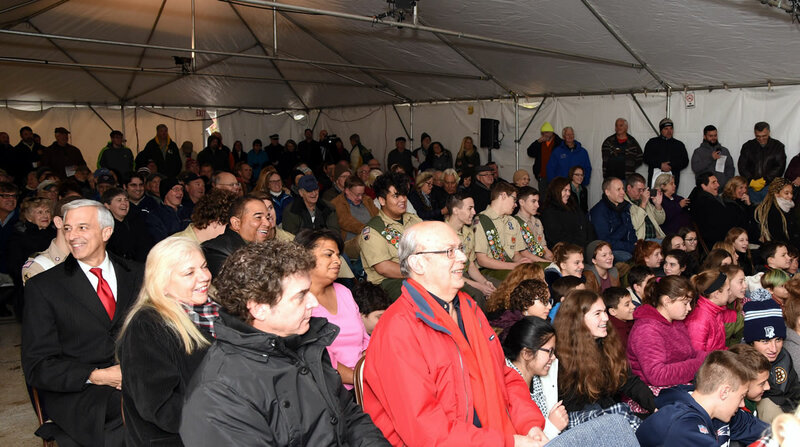 A crowd of 350 people witnesses the ceremonial launch of the Block Island quarter. U.S. Mint photo by Jill Westeyn. Chariho Middle School Students watch the ceremonial launch. U.S. Mint photo by Sharon McPike. Kids proudly hold their new Block Island National Wildlife Refuge quarters. U.S. Mint photo by Sharon McPike. Depicted on the quarter’s reverse (tails side) is a scene emblematic of the wildlife refuge — a black-crowned night-heron flying over a view from the beach at Cow Cove looking towards Sandy Point. The North Lighthouse is seen in the background. 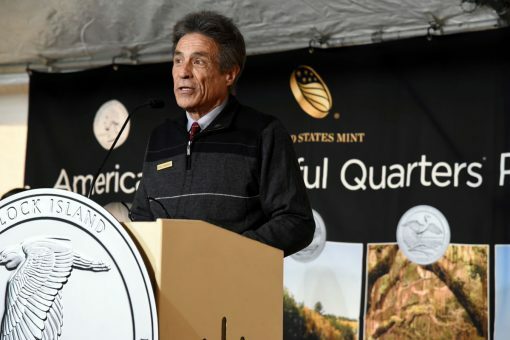 "Coins are symbols of our past, our present, and our future," said Mint Director David Ryder. "This new coin will stand as a tribute to the National Wildlife Refuge — a safe haven for migratory creatures and a testament to what dedicated humans can do to protect our world." Mr. Ryder shared the stage with James Kurth, deputy director of the U.S. 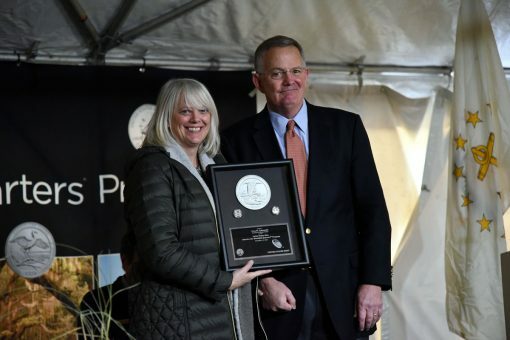 Fish and Wildlife Service; Janet Coit, director of the Department of Environmental Management, who spoke on behalf of Governor Gina Raimondo; and Charlie Vandemoer, manager for the Rhode Island National Wildlife Refuge, which oversees the Block Island National Wildlife Refuge. 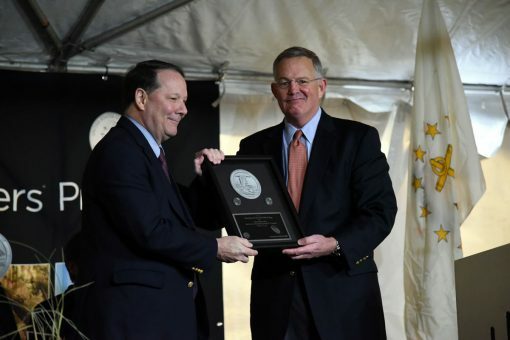 David J. Ryder, Director, United States Mint, presents Block Island National Wildlife Refuge quarters struck on the first day of production to James Kurth, Deputy Director Fish and Wildlife Service during the launch ceremony. U.S. Mint photo by Sharon McPike. Department of Environmental Management Director Janet Coit accepts Block Island quarters struck on the first day of production from United States Mint Director David J. Ryder. U.S. Mint photo by Sharon McPike. Rhode Island National Wildlife Refuge Manager Charlie Vandemoer serves as Master of Ceremonies during the event. U.S. Mint photo by Sharon McPike. The Chariho High School Student Choir, students from Chariho Middle School, and members of Boy Scout Troop #15 also participated in the event. 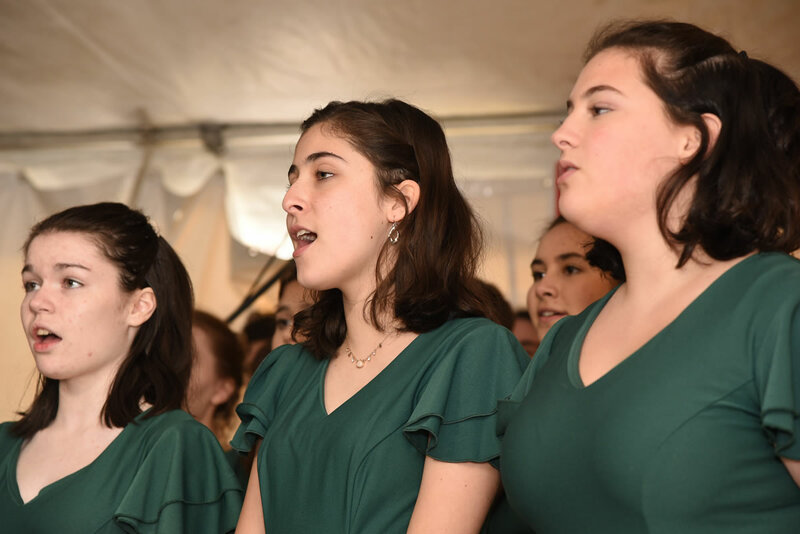 The Chariho High School Student Choir sings the National Anthem during the quarter launch ceremony. U.S. Mint photo by Jill Westeyn. Chariho Middle School Students participate in the ceremonial launch. U.S. Mint photo by Sharon McPike. 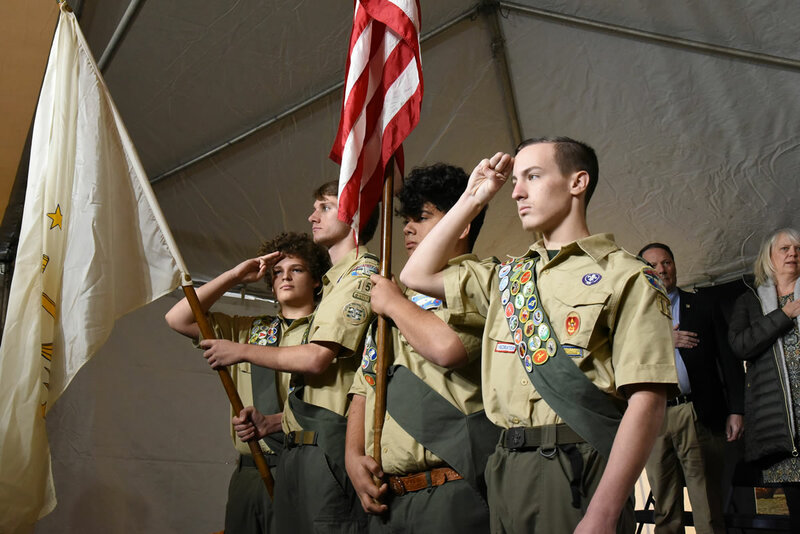 Members of Boy Scout Troop #15 present the colors during the Block Island National Wildlife Refuge quarter launch in Charlestown, R.I. U.S. Mint photo by Sharon McPike. 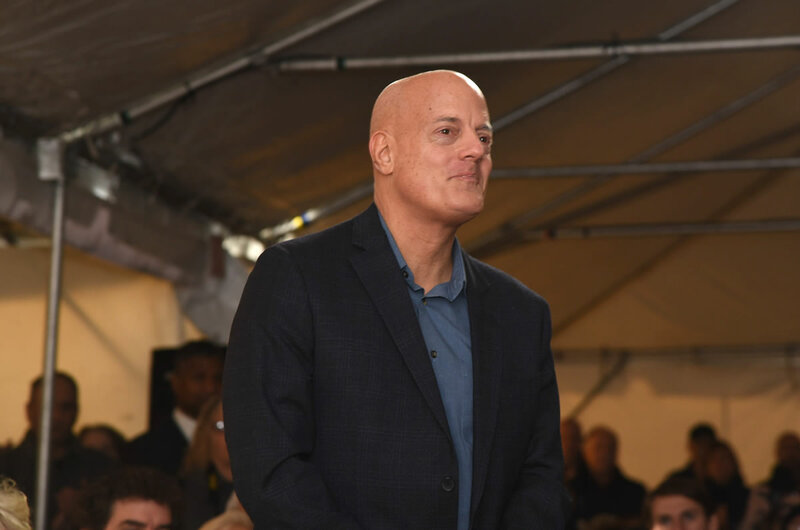 In addition, Artistic Infusion Program artist Chris Costello attended the ceremony. Costello created the image found on the quarter’s reverse. Artistic Infusion Program artist Chris Costello stands to be recognized during the ceremonial launch of the Block Island National Wildlife Refuge quarter. U.S. Mint photo by Jill Westeyn. 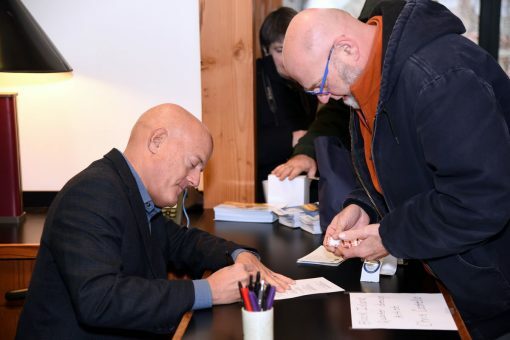 Many of those who attended the launch ceremony took part in the traditional coin exchange with quarters provided by Washington Trust. About $12,000 in P-mint mark Block Island quarters were swapped for cash. Artistic Infusion Program artist Chris Costello signs items for attendees of the ceremonial launch. U.S. Mint photo by Jill Westeyn. Another highlight for 35 collectors and local enthusiasts was a coin forum held on the evening before the launch ceremony where attendees listened to and asked questions of U.S. Mint officials. Block Island quarters started entering circulation on Tuesday, Nov. 13. (See photos of the quarter.) The U.S. Mint on the same day released them in rolls and bags for collectors. Available products include quarters produced at the Philadelphia, Denver and San Francisco Mints at prices ranging from $18.95 to $46.95. The U.S. Mint’s America the Beautiful Quarters® Program launched in 2010 and will honor 56 national parks and other sites through 2021. The Block Island National Wildlife Refuge quarter is the 45th released and the final of the five unique 25-cent designs for 2018.